In the USA, pedestrian slip resistance standards for flooring have traditionally been pass-fail. For instance, a coefficient of friction (COF) of 0.60 might be considered “safe” but 0.59 was “not safe.” This applied to any situation provided the floor was level. Recently the American National Standards Institute (ANSI) has published some standards that are a bit more detailed. Depending on the value of the dynamic coefficient of friction there is a “lower probability of slipping” potential, an “increased probability …” and a “higher probability.” For the “increased probability” regime, action is recommended, depending on the tile or other flooring’s intended use, to reduce risk. Under either of these systems there’s no consideration of what the use of the floor is. For example, a 30th floor office building elevator lobby would have the same slip resistance safety standard as a swimming pool deck. An indoor shopping mall in sunny Las Vegas could have the same safety standard as an outdoor walkway in rainy New Orleans. This could put too much restriction on flooring choice in one situation, and/or an insufficient safety standard for another. Australia and New Zealand, which are decades ahead of the United States in the serious study of slip and fall accident prevention, has established some slip testing standards based on the situation and based partly on some earlier standards established in Germany. As racing fans in Britain say, one should choose “the right horse for the course.” The Australia/New Zealand standards were established in 1999 (Standards Australia HB 197–1999 and ASNZS 4586:1999) and slightly expanded in 2013. High PTV corresponds to high wet slip resistance, or a very low contribution of the floor surface to the risk of slipping when wet. Table 1 below shows suggested minimum wet PTV’s for various situations. These can be helpful to building owners who want to prevent slipping injuries and the human and financial costs they incur. “Accessible” in the table refers to areas intended to be accessible to the disabled. 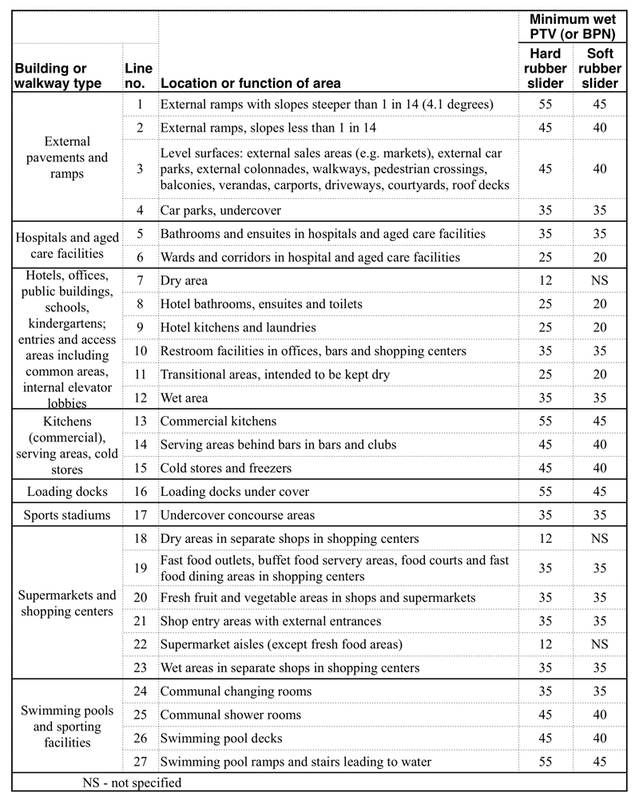 Table 1 shows that six “dry in use” of the 23 categories have no requirement for wet slip resistance. However, these areas should be kept free of grease, dust, tracked-in water, and spills. Generally, at least 10–15 feet of absorbent matting is needed to dry shoe bottoms before reaching the hard floor when it’s wet outside. Ropes along the edges of the mat can keep people from straying off the mat before their soles are dry. A dry mop, washed first to remove any oil, is needed to take up water dripping from raincoats. Umbrella bags on a stand at the entrance can help control drips. The highest slip resistance in Table 1 is specified for outdoor ramps, and for swimming pool ramps and stairs that lead into the water. Safety Direct America conducts pendulum testing both in the laboratory and in the field. We also offer the Sustainable Slip Resistance test that is specified by McDonalds Restaurants for assessing how well wet floor slip resistance will hold up after heavy wear from foot traffic. To follow the 2012 International Building Code, ceramic tiles that are used indoors under wet conditions should also conform to ANSI Standard A137.1 wet dynamic coefficient of friction requirements. Testing uses the BOT-3000E digital tribometer. This instrument, lower in speed than the pendulum, is generally not considered suitable for testing outdoor flooring. By using appropriate floor slip resistance testing methods and standards, building owners, managers, designers and architects can make intelligent choices in selecting flooring appropriate for each use in order to help minimize risk of slip and fall accidents. Wet static coefficient of friction testing (SCOF) as described by the misleading ASTM C1028, is no longer considered a valid or reliable slip test method and it was officially withdrawn by ASTM in 2014. Americans caring for buildings and floors must now catch up with the slip resistance standards that have been in use for years in other countries (such as the pendulum test standards) and the new American dynamic COF tests like ANSI B101.3 and ANSI A137.1 in order to help end the epidemic of slip and fall injuries and lawsuits here in the USA. The tools are in place — all that remains is to use them.